If you want to claim the victory, then you need the Yonex Voltric 80, perhaps the most powerful racket every created. This heavy-head wonder delivers unstoppable smashes, provides you with plenty of control and an outstanding maneuverability. If you want to know more about it, and how it can help you to take your game to the next league, then come with me and check this badminton racket review. 2 Design and Construction: Why Is It So Powerful? Massive power. For unstoppable smashes and powerful shots. Amazing control. It feels very solid and stable all the time. Excellent maneuverability. It’s agile and fast enough. 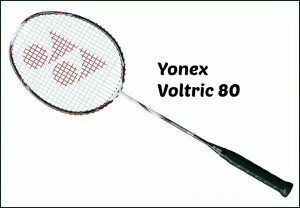 If you are an aggressive player, then you won’t find a better choice than the Voltric 80. If you are looking for the best display of power, then this racket is everything you need. Along with the amazing control and excellent maneuverability it offers, it’s impossible not to see the great potential of this racket. Although, it’s only suitable for advanced players who are used to play with a heavy-head racket. Want to get it? Then just click the button below and get the most powerful racket in existence. Not convinced yet? Then, just keep reading and discover everything about this racket. Design and Construction: Why Is It So Powerful? It’s essential to review in detail all about its design and construction, as this will bring us a light on why it is such a powerful racket. I really mean it, it scores a 10 out of 10 in terms of power. In terms of aesthetics it looks very well. The combination of colors looks attractive and elegant at the same time. Moreover, from a first glance you can tell it’s a powerful racquet. Improved and faster frame. One of the most important things here is that the new design of the frame allows it cut faster through air, which is of great help with power shots. It may not be as fast the Yonex Nanospeed 9900 or the Yonex Nanoray 900, but still very fast. The string tension. It’s pretty good in fact, it means you can start playing with it right off the bat. But if you want more tension, then you just need to string it tighter and that’s it. A stiff yet not-so-stiff shaft. The shaft is stiff, yet it doesn’t feel much like that. It’s a great feature, because it allows you to send powerful and steeper smashes. Outstanding NANOPREME technology. One of the most remarkable features of the Voltric 80, and one of the reasons of its tremendous power, is that it uses the outstanding NANOPREME technology, which brings it plenty of strength, top-notch repulsion and excellent elasticity. Be more aggressive. One thing I really like about this racket is that it has been designed to produce a sharp and powerful sound each time you hit the shuttle. This little feature will make the tone of the game more aggressive and make you perform at your best. Finally, it comes with a large sweet spot which guarantees you a higher success rate and far more control. The unique I’d be cautious of is that it can tire your wrists faster than other rackets. This is something to take into account. Now it’s time to review some aspects more related to its performance during the game. It’s solid, fast, powerful, brings you total control and comes with excellent maneuverability. But let’s see how well it performs during the game. At this point it should be clear that smashes are top-of-the-line. They are powerful, steeper and precise. All thanks to the NANOPREME technology, its incredible shaft and powerful heavy head. Unlike other rackets, with the Yonex Voltric 80 the clears are effortless. The swing is very fast and smooth, which is exactly what you need. Thanks to its aerodynamic design and superior stability this racket sends fast, powerful and precise net shots. This make it excellent for net play as well. Despite being heavy head, it defends very well. Defensive clears, drives, lifts and defensive game in general is pretty good with this racket thanks to its design and aerodynamics. As you can see the Voltric 80 is one of the best badminton rackets ever created. Along with the Arcsaber 10, it’s one of the best products by Yonex.